Finally, after a 13-year absence, a musical won the Golden Globe, although it was greeted with derision by the media for having bested the Coen Brothers’ Fargo. And even worse, Madonna won Best Actress in a Musical or Comedy over Frances McDormand. Quieting the din that erupted, Celeste Holm, who was the original Ado Annie in Oklahoma and who had won an Oscar for Gentleman’s Agreement, came to Madonna’s rescue in a bold defense that the Los Angeles Times highlighted just before the Oscar ceremony. It would have no impact because the Academy failed to nominate Madonna. 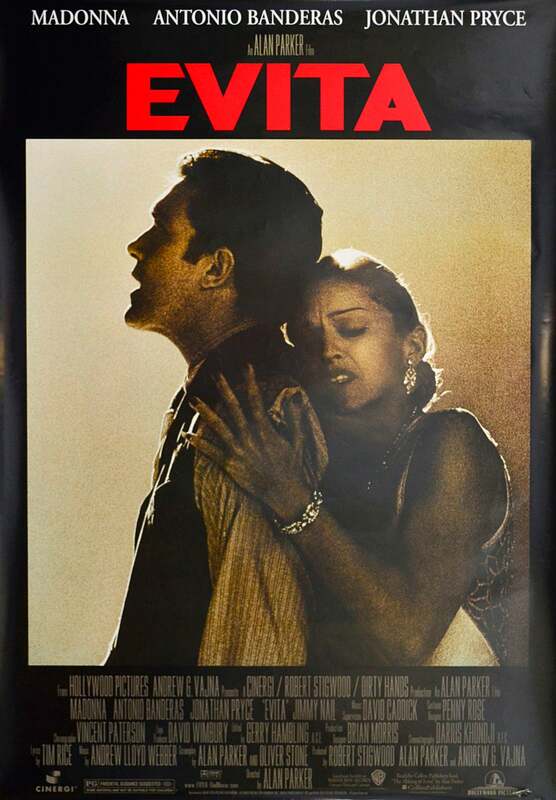 Evita, of course, was the musical that established Andrew Lloyd Webber as a force to be reckoned with. It started out as a rock opera concept album and after American theater icon Harold Prince was asked to stage it, it became a sensation running for years in theaters all over the world. A film version was attempted a number of times including one with Meryl Streep in the title role and Oliver Stone directing. But it was not until Madonna expressed interest that the film went into production. Tim Rice later told the HFPA that without Madonna he would never have approved the project. With Alan Parker signed to direct and Antonio Banderas playing Che Guevara, it was the most anticipated movie of the year. The response from both the critics and the public was tepid. The film cost $55 million to make and grossed only $141 million worldwide. It did, however, win three Golden Globes. Besides Best Musical or Comedy and Best Actress, it won Best Song, ‘You Must Love Me.” which was written especially for the movie. Though the film was nominated for numerous other awards, the only one it received was from the Academy for the same song. Overall it was a disappointment for everyone involved. Antonio Banderas (his best work ever) was nominated for Best Actor in a Musical or Comedy but Tom Cruise as Jerry Maguire beat him. Other nominees were Kevin Costner for Tin Cup, Nathan Lane for The Birdcage, and Eddie Murphy for The Nutty Professor. There were no musical or comedy performances in the supporting categories. The other Best Picture Comedy or Musical nominees were The Birdcage, Jerry Maguire, and Everybody Says I Love You. 1997 was unusual in that a total of eight films won Golden Globes that year; it was only Evita that won three.